Pinus elliotii, as described in 1880 by Georg Engelmann (1809–1884), is commonly known as slash pine, yellow slash pine, or swamp pine. This species honors Stephen Elliott (1771 - 1830), who first distinguished the tree as a variety of Loblolly pine in his Sketch of the Botany of South Carolina and Georgia. Ethnobotany. The typical variety (var. 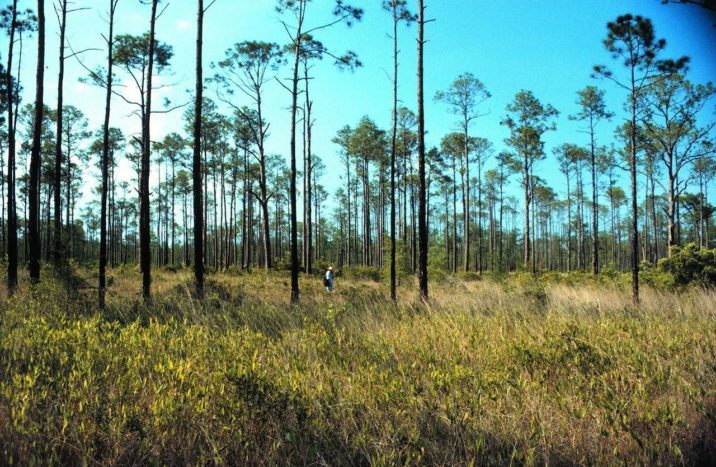 elliottii) is the fastest growing of the southern yellow pines, much planted in the United States outside its native range. It is very susceptible to ice damage and fusiform gall inland. 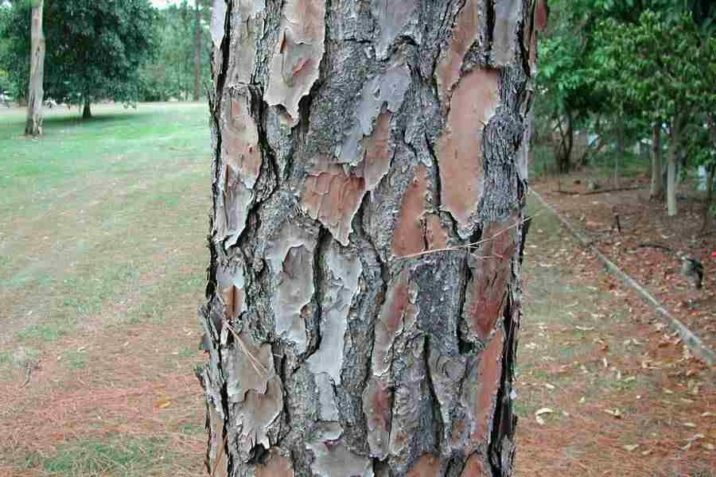 This is a naval stores pine, but it is considered increasingly important in plantations as a lumber and pulpwood pine. It is much planted in subtropical and warm temperate climates worldwide, particularly in Brazil. Unlike the type variety, var. densa has not been used for naval stores. However, it is planted for timber production. For example, it is planted for commercial uses by the U.S. Air Force land managers at Avon Park Bombing Range as well as by Lykes Brothers ranch in south central Florida, and seedlings are offered for sale by the Florida Division of Forestry. Description. 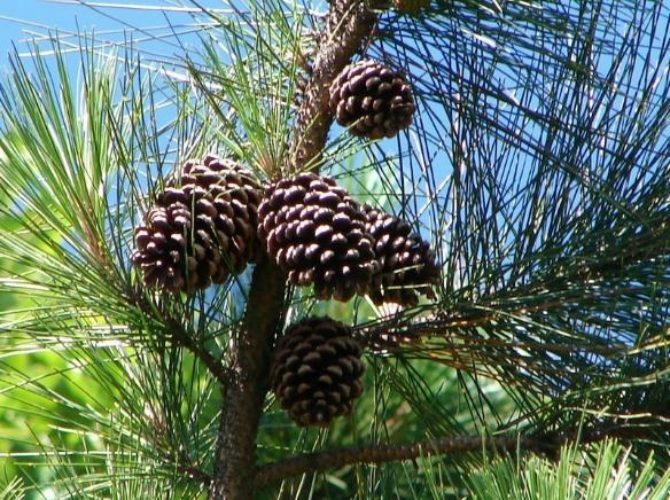 Slash pine is an evergreen coniferous species of tree that grows to mature heights of 100 feet (30 m) with a straight to contorted trunk up to 32 inches (0.8 m) in diameter, measured at breast height and conic crown that becomes rounded or flattened with age. Bark is orange- to purple-brown in color, irregularly furrowed and cross-checked into large, irregularly rectangular, papery-scaly plates. Twigs are stout, rough and scaly; up to 0.4 inch (1 cm) thick, colored orange-brown, aging darker brown. Foliar buds are cylindric shaped, colored silvery brown and measure 0.6 to 0.8 inch (1.5 - 2 cm) long with fringed scale margins. Leaves (needles) are borne in clusters of 2 or 3 per fascicle, spreading or ascending from their origin, persisting circa 2 years on the tree. Needles measure 6 to 8 inches (15 - 20 cm) long and 0.048 to 0.06 inch (1.2 - 1.5 mm) wide, growing straight, slightly twisted, pliant, and yellow- to Blue-green in color. All surfaces bear stomatal lines, finely serrulate margins, and abruptly acute to acuminate apices. Foliar sheaths measure 0.4 to 0.8 inch (1 - 2 cm) with a persistent base. Pollen cones are cylindrical-shaped, 1.2 to 1.6 inches (30 - 40 mm) long, and purplish in color. Seed cones mature 2 years after pollination, falling the year after seed-shed. They are borne single or in pairs, with symmetric, lance-ovoid form before opening, ovoid or ovoid-cylindric when open. Cones measure 3.6 to 7.2 inches (9 - 18 cm) long, colored light chocolate brown, with a peduncle up to 1.2 inchs (3 cm) long. Apophyses are lustrous (as if varnished), slightly raised, and strongly cross-keeled. Umbos are centrally located, depressed-pyramidal shaped, with a short, stout prickle. Seeds are ellipsoid shaped with an oblique tip. Seed body measures 0.24 to 0.28 inch (6 - 7mm), colored dark brown with an attached wing up to 0.8 inch (20 mm) long. Distribution. This species is native to southeastern USA — Alabama, Florida, Georgia, Louisiana, and South Carolina. It has been introduced in subtropical and warm temperate areas worldwide. In South Africa, it is cultivated for timber, and has invaded forest margins and grassland in Mpumalanga. It has also invaded lower-altitude, higher-rainfall areas in Zimbabwe. Hardy to USDA Zone 9 — cold hardiness limit between 20° and 30°F (-6.6° and -1.1°C). Attribution from: R. Kral, Flora of North America Editorial Committee (editors); Flora of North America North of Mexico, Vol. 2; ©1993, Oxford University Press. 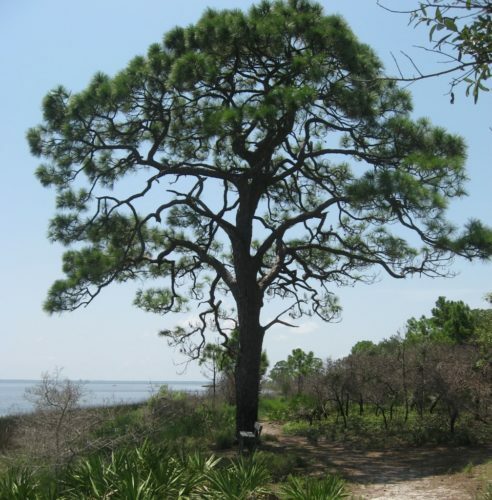 Pinus elliottii at St. Joseph Peninsula State Park, Gulf County, Florida. Maritime slash pine Pinus elliottii savanna on Mississippi/Alabama state line near Bayou Heron, MS.
Pinus elliottii — foliage and seed cone detail. Pinus elliottii — bark detail. 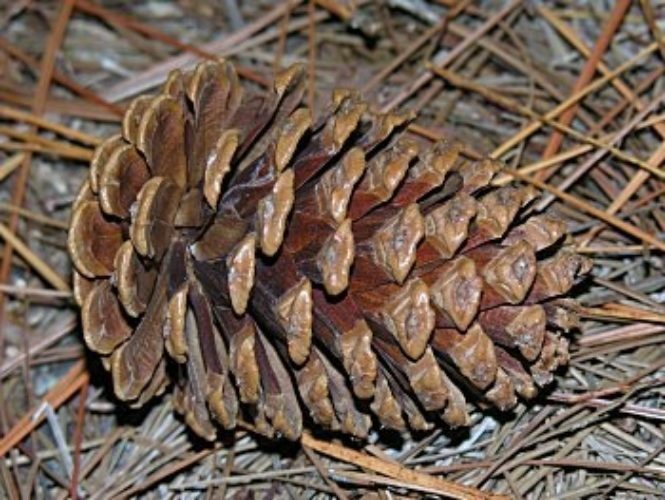 The glossy chestnut-brown cones are not as prickly as those of Loblolly Pine.